Compared with other major Chinese cities, Chengdu is simpler to navigate on foot. The heart and exact center of the city is Tianfu Square. Three ring roads then form concentric circles around Tianfu Square. Renmin Road bisects the ring roads on a north/south axis. To walk from Tianfu Square to the southern part of the first ring road takes about 25-30 minutes. Most important sites are within the second ring road and many bars, clubs, and restaurants are concentrated in the south end of the city between the first and second ring roads. Unfortunately, Chengdu's street names change practically every kilometer, so it is important to familiarize yourself with landmarks such as Tianfu Square, the train stations, and the ring roads. The Chengdu Shuangliu International Airport is the sixth largest in China, and operates services to 70 domestic cities and 20 foreign cities, including Los Angeles, London, Sydney, Melbourne, Amsterdam and Delhi. The airport is situated 20 km (12.4 m) from the city center: a cab from the city center will cost around RMB 60. Shuttle buses also operate from the city and are a more economical option, costing around RMB 10. The Chengdu Railway Station is the largest in southwest China. 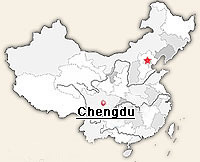 It is linked directly to major cities across the country including: Beijing, Shanghai, Kunming, Chongqing and Xi'an. Tickets can be bought in advance from any of the city's travel agencies. Hotels and hostels also arrange travel for a small surcharge, which allows visitors to avoid waiting in line at the station or trying to find their own booking agent. The railway station sits in the north of the city and can be reached from the city by bus or by taxi. Chengdu has six long-distance bus stations, serving destinations across Sichuan and Tibet, as well as a variety of tourist attractions in the close vicinity including Yibing, Emei Mountain and Leshan Mountain. Visitors should check in advance which station their chosen destination can be reached from.